Dr. Anupam Ray, Consul General of India, then shared some of his personal experiences from India and commended the noble work being done by Pratham. Former Miss Universe and Bollywood star Sushmita Sen stressed the importance of education for all. And Pratham CEO Dr. Rukmini Banerji reflected on her journey with the organization and outlined her vision for the future. Video highlights captured by click2houston.com. 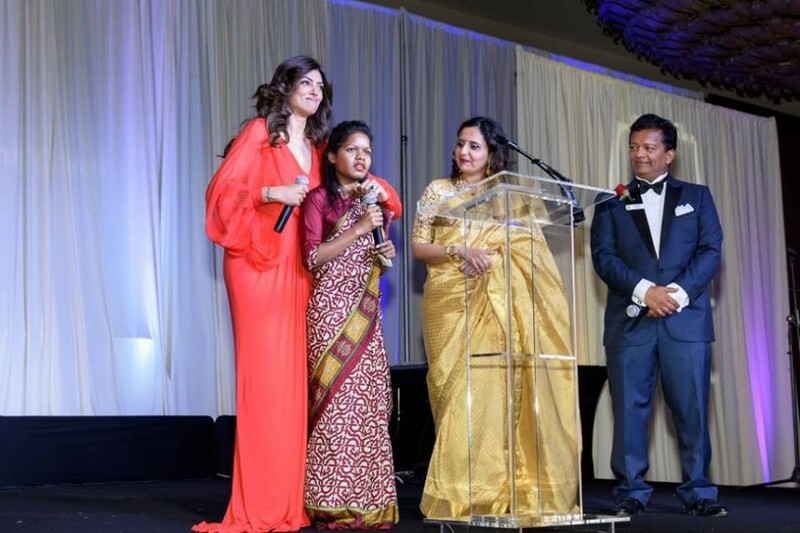 But perhaps the highlight of the evening was Sanjana Das, a young woman from Odisha, who shared her own story of overcoming hardship to attain personal and financial independence with the help of Pratham’s vocational training program. “Pratham gave me wings and a backbone,” Das said, leaving many in the room teary-eyed. The night culminated in a scrumptious dinner provided by Dawaat Catering and music by the Z Band accompanied by DJ Gary. We thank all the institutional and corporate sponsors as well as individual supporters and volunteers for making the evening a resounding a success! View more photos from the gala courtesy Bijay Dixit, Unique Photo Images on Facebook.